In the worldwide agriculture industry, silos historically have been used to store harvested products. Many existing silos around the globe exhibit sub-optimal operating conditions, often due to the lack of knowledge about pressure distribution, flow and other variables that affect the behavior of stored products. Such conditions can lead to often-devastating accidents and collapses in these structures. To learn more about such issues, Prof. Fábio Selleio Prado and the students André Candido de Vasconcelos, Bruno Toledo de Vasconcelos e Kaique Chammas Uzan at the University Center of the Mauá Institute of Technology performed an academic study using Rocky DEM software. Findings were and presented at Brazilian Congress of Bridges and Structures in May 2018 in Rio de Janeiro. The Brazilian agricultural industry has seen a continual increase in grain production and stock. However, since 2000, storage capacity has remained static, resulting in a country-wide grain storage deficit. Carlito Calil Junior of the Department of Engineering of Structures of the University of São Paulo has noted that, in general, silos used for farm storage in Brazil have a relatively low height compared to the diameter (or side) and incorporate a flat bottom. The greater diameter increases storage capacity; furthermore, handling materials in low silos is easier and less expensive. The majority of these silos are built using concrete, a versatile material that can be molded on-site, precast, conventionally or prestressed. Consequently, it has become important to study the structural behavior of concrete silos that have a low height-to-diameter ratio. However, structural analysis is not simple to perform in this application, since it must analyze different load types on the structure (wind, unloading and grains), several forms of unloading (which produces combinations of different efforts), and many types of storage materials that exhibit a wide variety of physical properties such as grain size, specific gravity, internal friction, and angle of friction with the wall. A final complication is that the grains can form granulate or powder, which can significantly alter the criteria of calculation. Therefore, computational analysis is necessary for a number of forms since the efforts are distributed in this type of structure. To perform the comparisons, the study used the existing silo project with some adaptations. This structure was designed using ANSYS® SpaceClaim, the analysis was performed with ANSYS Mechanical, and the simulation of grain movement was reproduced accurately in Rocky DEM. For an initial analysis, stresses were evaluated every four seconds during unloading. This was used to evaluate when maximum pressure occurs, in an effort to decrease the time seeking the closest instant of maximum stresses. With rectangular elements of 0,25 m of height each, pressures were determined when 3,875 leave from the coordinate m (4,00 m – 0,25/2 m), which represents the geometrical center of the first element to receive pressure on from top to bottom, determining the respective values walking in a step of 0,25 m until 0,125 reaching the center of the lowest element in the vertical wall of the silo with zSAP = m.
Rocky DEM, used in the second analysis to obtain pressure values, provides the modulus values of pressures when they are exported to ANSYS software. For comparison purposes, the module was calculated between horizontal pressures (ph) and tangential (pw) for three flow channels. 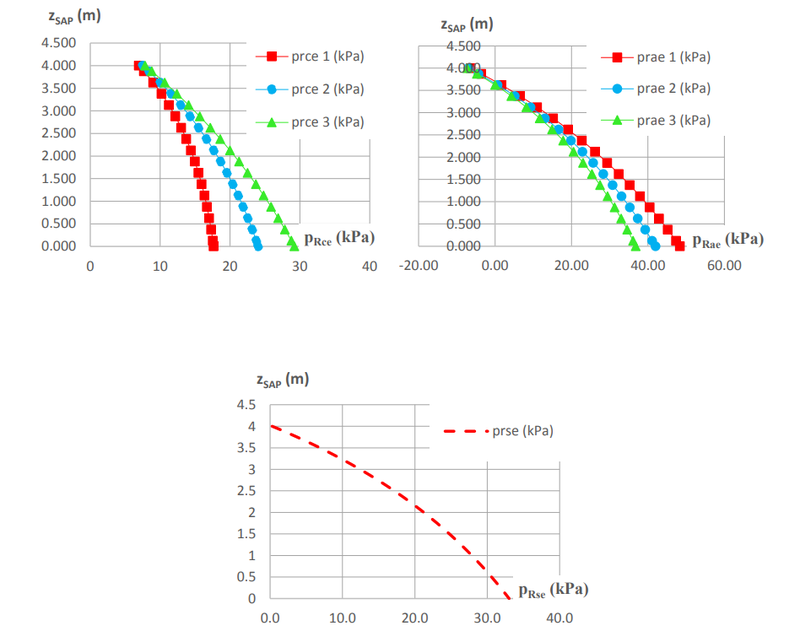 The next figures show pressure values noted and calculated for three channels of flow proposed by the standard EN-1991-4-2006’s directives of calculation, in which prce is relative to the pressures in the channel flow exit, prae to the pressures in the zones adjacent to the channel exit, and prse to the pressures that take place distant of the channel flow exit. In the Rocky/ANSYS analysis, pressures and stresses can be valued for each time step. So, it is difficult to obtain the ideal values for comparison with the results obtained by the standard EN-1991-4-2006. Therefore, the study was carried out first with the stresses, obtaining the maximum results for time intervals varying every four seconds. The maximum principal stress occurs in a time close to 18 seconds. From this, the study then evaluated stresses in smaller time steps to obtain a more-refined analysis near the instant 18 seconds. Thus, a time step of one second was adopted, evaluating the results until obtaining the stress peak that should be close to the instant 18 s. The instant of 17 s (seven seconds of discharging) was the time when maximum principal stress was obtained in the structure. After this instant, the stress decreased. The figure below shows how the stresses obtained to follow the pattern of pressure distribution along the wall as proposed by the European standard EN-1991-4-2006. 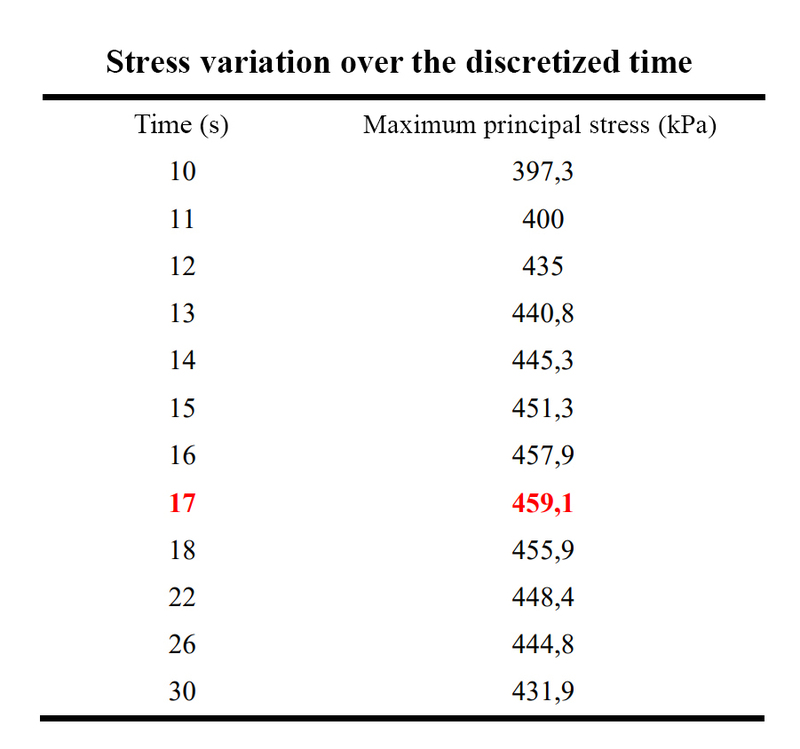 Table 1 combined with the figure of maximum principal stress shows how stresses vary over time, with more instants being analyzed near the instant of 18s, to obtain when the stress peak actually occurs. Pressures were obtained in different ways for the two analyses. In the first iteration, through manual calculation, three alternatives were performed for the flow channel geometry proposed by the European standard EN-1991-4-2006, with the possibility of channel characteristics, which should change not only with the grains’ characteristics but with environmental and instant characteristics as well. Different modulus values were obtained for horizontal and tangential pressures in each case, even with slightly different distributions, depending on the estimated geometry for each flow channel. However, when making a comparison with pressures obtained directly by the interaction of the grains with the structure — conducted using Rocky software — the results obtained by the European standard are satisfactory and, in fact, seek to meet design requirements, when compared with the refined analysis. Nevertheless, the Rocky/ANSYS interaction revealed satisfactory results in terms of pressure distribution and dynamic analysis observed in a simplified way by several studies over time. With automatic interaction between the grains and the structure causing variations of loading, the study confirmed that the behavior of particles during discharge is close to the expected one proposed by the standard. This points to the importance of refining such an analysis, in which pressures that the grains exerted on the structure are treated as liquids, in order to understand what may have caused many silo catastrophes both in the past and today. Although the study verified the feasibility of using the European standard with less-sophisticated software to design low concrete silos with eccentric discharge, a more-powerful software can help to analyze the security of the structure, predicting previously unknown phenomena that can lead to more-efficient, innovative silo design. Using Rocky DEM coupled with ANSYS is not only a matter of economy and safety. Its predictive powers have been proven accurate and invaluable when it comes to particle simulation. Fábio earned his undergraduate degree in Civil Engineering from the Maua Institute of Technology (2009), his Master degree in Civil Engineering from Polytechnic School of the University of São Paulo (2013). Since 2013, he teaches at the Mauá Engineering School, helping students with his knowledge in concrete structures, structural theory, structural analysis and structural dynamics.